Affirmations are a way to articulate how you choose to live your best life no matter what circumstances or challenges you face. They are powerful, positive statements you already believe to be true about yourself and your life, even though they often are not yet your reality. 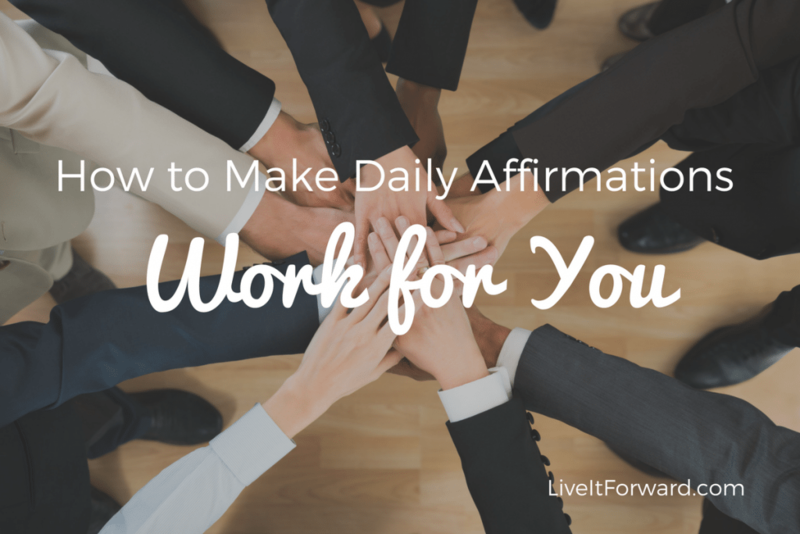 In episode 085 of The Live It Forward Show, you’ll learn all about how to make daily affirmations work for you. You repeat your affirmations every day. Affirmations equip you to live it forward. Affirmations empower you to show up and shine in your most important life roles such as spouse, parent, business owner, and friend. 3. Why Don’t Affirmations Work? If affirmations are so powerful, why don’t they work? In a word, most affirmations are “fake.” More specifically, they are fake to you. Most affirmations are promoted as copy-and-paste tools. Yet when other people create affirmations for you to copy-and-paste into your life, the affirmations have little impact on you because they are not authentic to you. They belong to someone else. For affirmations to be powerful, you must create them! They must come from your DNA so they are authentic, personal, and heartfelt. 4. How to Make Affirmations Work for You? How do you create your own affirmations? How do you make sure they come from your DNA and are not just a parroting of someone else’s desires or reality? Easy. You write them yourself. It is hard…unless you have a system designed to make it simple for you to connect with what you believe about yourself and the life you want to live. With that baseline, it’s easy to craft your own powerful affirmations that resonate with you and turn what you already believe into your reality. Second, use positive phrases instead of negative ones. For instance: I am wise with money. I joyfully save 10 percent of everything I earn because I understand the power of compound interest. I also have a financial freedom jar that I gladly put additional money into every single day. Third, tap into the power of the Pareto Principle (i.e. The 80/20 Rule). The Pareto Principle states that 20 percent of your efforts produce 80 percent of your results. Although this book contains 31 quotes and questions, you don’t want to repeat 31 affirmations every day. That’s way too many! Instead, use this book to develop 31 potential affirmations and pick 6-10 that inspire you the most. These 6-10 affirmations are your 20 percent that will empower you to achieve 80 percent of your results and allow you to live it forward into your dream reality.